Knowledge Ecology International organised a seminar on 3-4 October gathering civil society speakers, international organisation representatives, and a representative of the broadcaster community. Discussions were based on a working document [pdf] for a treaty on the protection of broadcasting organisations, and a revised consolidated text [pdf] on definitions, object of protection, rights to be granted and other issues, prepared by the SCCR Chair Daren Tang of Singapore, to be discussed at the next session of the WIPO Standing Committee on Copyright and Related Rights, from 26-30 November. Heijo Ruijsenaars, head of intellectual property law at the European Broadcasting Union, explained the need for broadcasters to have additional rights going beyond the 1961 Rome Convention for the Protection of Performers, Producers of Phonograms and Broadcasting Organizations. Key reasons for a treaty include the need for broadcasting to protect their investment in programming and dissemination, he said. The current protection in view of the technology is not sufficient in a time where viewers want to access content whenever and wherever they want, which means it has to be delivered in a different way than traditional broadcasting, according to Ruijsenaars. This shift in technology also gave way to increasing piracy, he said, adding that signal piracy is a global issue and it is important to have a treaty covering everybody on the planet. Ruijsenaars said there is evidence of ever-growing piracy and WIPO does not discuss enough the reasons underlining broadcasters’ neighbouring rights. For broadcasters it is not the delivery of signal that matters, he said, but that the public is provided with programmes. Benefits for the public of those programmes include the provision of diversified information on national and local matters; educational content; special programming for niche or minority audiences; enhancement of public awareness and media literacy; supporting of independent audiovisual production; promotion of local authors, actors and artists; and the creation of new services on multiple platforms, his presentation listed. If the focus of the discussion remains merely about the signal, he said, then it misses the broadcasters’ activity. Broadcasters make a programme, then embed it in a signal, which is then broadcast. The broadcast is the tool by which programmes are delivered to the public but producing the signal is just a necessary technical activity, he added. The most important element of broadcasting is its independence from the audience, according to Ruijsenaars, it does not matter how many people are watching. It is also independent from the content since the content is covered by copyright, and independent from transmission, since each signal has its own protection. In the digital age, most people have hybrid television which can receive both online and traditional signal from broadcasters at the same time, without them being aware of, or caring about, the difference, he said. In Europe, some 60 million households own an internet-connected TV set, he added. Anubha Sinha of the Center for Internet and Society, said the issue of signal piracy affects mostly sports broadcasters, and a potential narrow treaty could address this particular problem. A treaty as the one considered at the moment could have unintended adverse effects, she said. Facebook recently acquired the rights to broadcast La Liga games in the Indian sub-continent, she noted, warning about the “weak treatment” given to exceptions and limitations in the current treaty draft. She added that the treaty would affect the existing commons and the methods by which commons are being made accessible today. The 1961 Rome Convention is narrow and broadcasters are facing competition from internet-based services that operate with fewer rights, but provide services that the public wants, which is part of the problem, according to James Love from Knowledge Ecology International. Citing SCCR Chair Tang’s current proposed language, Love said that the definition of a broadcaster stating that “entities that deliver their programme-carrying signal exclusively by means of a computer network do not fall under the definition of a ‘broadcasting organization'” intends to exclude companies such as YouTube, Spotify, and Netflix, but would include other companies being broadcasters and also having internet platforms at the same time, such as the BBC. That is creating a special right. which might be challenged by other companies arguing that those rights are contrary to a level playing field, he said. It is also very easy for companies such as Facebook and Amazon to buy a radio station somewhere on the planet, thinking otherwise is naive, he said. This point was also made by Ryan Merkley of Creative Commons. Love produced a colour-coded document [pdf] showing developments in technologies to distribute, broadcast or stream audio and audiovisual content from 1887 to 2018. In white, the document lists what concerns traditional broadcasting, in yellow internet technologies, in blue technologies to make physical copies of audio and audiovisual recordings, and in green norm-setting activities. The vast majority of items listed belong to the yellow sections. Players in the yellow fields will be the beneficiaries, he said. “You will be transferring money” to large platforms, the biggest of which are in the United States, he said, adding that the concentration will be much larger than in the radio and television arena. To remedy those potential dangers, Love’s presentation suggested to eliminate post-fixation rights, and install mandatory exceptions including news of the day, public affairs, documentary films, education, and quotations. Ruijsenaars argued that the European Union has legislation protecting post-fixation rights, and that did not bring any issues either with rights holders or the public interest. Love also challenged the proposed 50 years of protection. “If you were to keep a copy of something for 50 years,” the chances are that no technology would still be able to read it, he said, adding that if the treaty protects post-fixation rights, it is no longer protecting a signal. 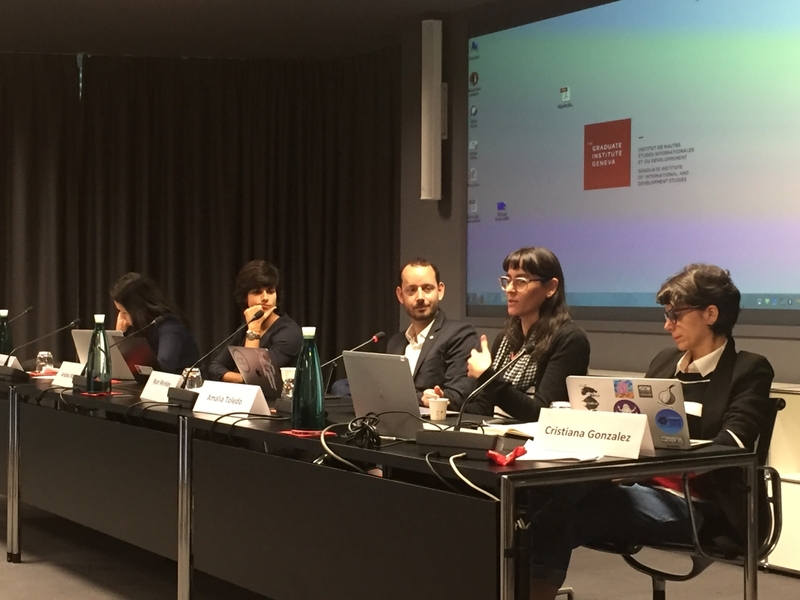 Cristiana Gonzalez of the Centro: Tecnologia, Espaços, políticas públicas, Brazil, also said the treaty should be confined to immediate transmission without post-fixation rights. In Brazil, she said, organisations may not acquire protection for any deferred transmission. The proposed term of protection should be no more than a few seconds, 24 hours if one wants to be generous, she said. Extending it further could have consequences for the public domain, impact cultural diversity and democracy, by for example preventing access to historical information, she said, adding that giving a monopoly over content could be dangerous. Merkley said the current draft of the treaty could have a number of negative impacts. The world has and is changing, he said, and it is no longer a matter of creating rules for industry alone. “Every one of you is a copyright holder,” he said, adding that the draft treaty forgets about the public. There have been many poor choices for the web, he argued, and the treaty would yet be another wrong choice. Negotiators have to be careful not to disturb the whole ecosystem to support an industry threatened by improvements in technology, he said. He also called 50 years of protection “unreasonable” and said in the most compelling case of protection for sports event broadcasting, should be termed in hours. The most alarming in the proposed text, according to Merkley is that it would give post-fixation rights for public domain works. “This is outrageous,” he said, as broadcasters do not own this content and did not create it so they should have no rights over it. Ruijsenaars commented that if the content is in the public domain, like a film, it can be found somewhere else than in the broadcast, which is protected. Amalia Toledo of the Karisma Foundation said the rights awarded by the treaty to broadcasters could impede or restrict the flow of information that may not be protected by copyright, such as news of the day, and speeches from public officials. In Latin America, she said, there are various examples of how the political power has used copyright protection to silence voices. This new right would be a direct attack on creators’ possibility to share their works as they see fit, she said. It would also ignore the public interest in having access to information, knowledge and culture, she added. If a treaty is agreed against signal piracy, the protection should be for hours after the transmission, not 20 or 50 years, she said. "Broadcasters Eager For Global Signal Protection; Others Warn Of Major Players Sneaking In" by Intellectual Property Watch is licensed under a Creative Commons Attribution-NonCommercial-ShareAlike 4.0 International License.